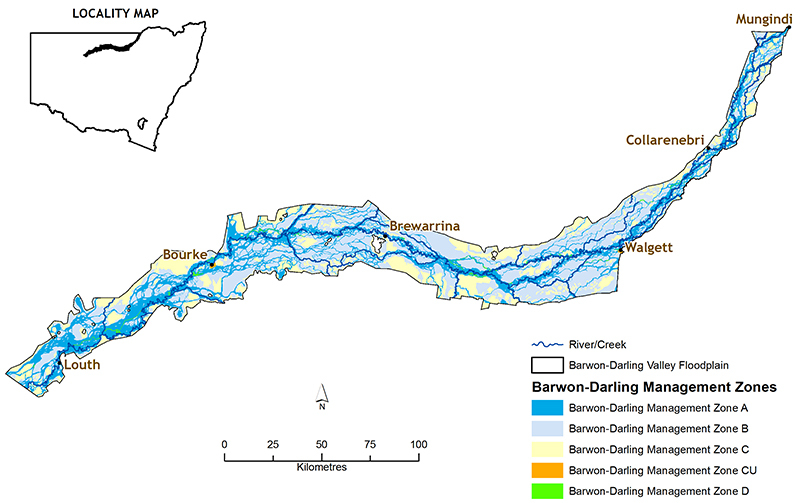 The Floodplain Management Plan for the Barwon–Darling Valley Floodplain 2017 (plan) commenced on 30 June 2017 and includes management zones, rules and assessment criteria for granting or amending approvals for flood works within the plan area. Information on this plan is available for viewing as described below. The Floodplain Management Plan for the Barwon-Darling Valley Floodplain 2017 is a detailed legal instrument written in the required statutory framework. The following maps are included within the plan and are available for download. A plain English overview of the rules and assessment criteria for each management zone is provided in the summary sheets which are available for download below. The summary sheets are included as a guide only. Click at any location within the plan area on the spatial map to identify the management zone at that location. The spatial maps of floodplain management zones contained on this website (“Spatial Maps”) are produced for information purposes only. The authorised versions of the maps contained in floodplain management plans are published on the NSW legislation website. The State of New South Wales, including the NSW Department of Industry, Skills and Regional Development (“the department”), does not give any warranty, guarantee or representation about the accuracy, currency or completeness of any information contained in the Spatial Maps (including, without limitation, any information included in the Spatial Maps which was provided by third parties). The State of New South Wales (including the department) provides the Spatial Maps without assumption of a duty of care to any person. To the fullest extent permitted by law, the State of New South Wales (including the department) excludes all liability in relation to the information contained in the Spatial Maps or for any injury, expense loss, or damage whatsoever (including without limitation liability for negligence and consequential losses) suffered or incurred by any person acting, or purporting to act in reliance upon any information contained herein. Applicants for flood work approvals use the Spatial Maps at their own risk when making decisions relating to the Spatial Maps. They should make their own enquiries with the department to confirm the impact of management zones on their application. The plan commenced on 30 June 2017 and is due for extension or replacement on 30 June 2027. The department road tested the major concepts of the plan with key stakeholders during a targeted (informal) consultation process over the period Tuesday, 13 October 2015 to Wednesday, 10 February 2016. The feedback received from targeted consultation was considered by an Interagency Regional Panel prior to the preparation of the plan for public exhibition. Community input into the preparation of the plan was invited during public exhibition over the period Friday 31 October to Tuesday 9 December 2016. All submissions received during the exhibition period were considered by an Interagency Regional Panel prior to the preparation of the plan for commencement. A general description of the method employed for the preparation of floodplain management plans under the Water Management Act 2000. A detailed description of how the method presented in the Technical manual has been applied across the Border Rivers valley floodplain. A general, plain English explanation of the key provisions of floodplain management plans. The overview is a summary that should be read in conjunction with the draft plan. Floodplain management plans are being developed under the NSW Healthy Floodplains Project which is funded by the Australian Government’s Sustainable Rural Water Use and Infrastructure Program as part of the implementation of the Murray-Darling Basin Plan in NSW.